Austria’s 2068 diesel switchers look somewhat out of place among the many elegant pieces of motive power of the ÖBB — a somewhat boxy piece of equipment that only its mother (or the crews that work on it) could love. Somewhat diminutive (compared to their modern locomotive power) at only 13.77 meters (15.8 cm in HO scale ) the locomotive still manages about 1,000 horsepower — with lots of pulling power at slow speeds. On the other hand, its large cab gives the impression of a creature whose head is too big for its body. But, with this locomotive, one of the most important features is not what you see, but what you hear — or rather what you don’t hear. Well, yes. But all major passenger and freight terminals still have some tracks that are not electrified or where the electric catenary may be shut off during construction work. These tracks include maintenance facilities where workers may need to get on the roofs of passenger or freight cars, tracks where intermodal containers are unloaded, and adjoining industrial spurs where overhead wires are not practical. And, those are only a few examples. Of course, when not needed for work on those special tracks, the diesel switchers participate in all other normal shunting activities, even when these take place under wires. So, there are a total of 16 different catalog numbers for this model. The locomotive with have (or will have a place for) a 21 pin decoder, which should even be able to handle additional user-installed functions. Jägerndorfer catalog illustration of a prototype 2068. Note the switching coupler, described below. By the mid 1980s, it was becoming obvious to the ÖBB, that more recent purpose-built diesel switchers (2060, 2062, 2067) were no longer adequate for the increasingly heavier cars and trains that needed to be handled in major terminals. All of these locomotives also had limited top speeds, which caused problems when they needed to be moved on the mainline from one location to another. Two and three-axle locomotive designs were eliminated due to the speed and other operating restrictions this configuration would again impose. So, the decision was made to order a four-axle diesel hydraulic. The order went to Jenbacher Werke (at the time, Austria’s second largest rolling stock manufacturer, behind SGP). For political and economic reasons, the ÖBB split its motive power orders among domestic manufacturers. Jenbacher Werke (Jenbach Works) is located in Jenbach, Tyrol, not far from Innsbruck. The town of Jenbach is best known for having two different narrow gauge lines terminating at its passenger station. As was the case with other motive power purchases up to that time, the 2068 was developed by Jenbacher Werke jointly with the ÖBB, rather than buying an off-the-shelf model. By that time ergonomics and crew comfort had become important specifications, leading to the large cab design, many features of which were later also incorporated in electric switchers. The cab has four control stations — two primary, on the right side in each direction of travel — and two auxiliary ones, which still have the most important control functions such as throttle and brakes. So, the locomotive can be operated from all four corners of the cab, giving the operator extremely good visibility during switching operations. As was typical of motive power orders in the second half of the 20th century, the ÖBB first ordered five pre-production demonstrators, which were built 1989-1990, numbered 2068.001-005. Then, between 1992 and 1994, Jenbacher built 55 more copies (starting with number 006) for a total production of 60 units. A few relatively minor internal changes were made between the first five units and the full order. The most significant difference between the first and second production runs is that the last 55 units have MU controls that allow them to operate in tandem (back-to-back), though that feature is seldom used. 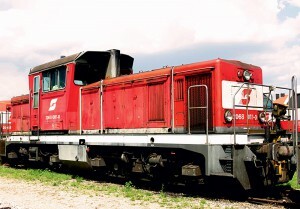 As the first five locomotives already had some differences from the main production run, they were substantially rebuilt in 1998 for use in oil refiners in the greater Vienna region. This included about half a dozen modifications that further reduced the possibility of igniting any ambient vapors. As with some previous diesel switchers, such as the 2067, the 2068 has a two-speed hydraulic transmission. In low gear, the top speed is 50 km/h (about 30 mph), but pulling power is greatly increased. In high gear (Streckengang or mainline gear), the top speed is 100 km/h. High gear is still used within terminals, when moving any substantial distance. The hydraulic transmission provides dynamic braking. The short frame allows the locomotive to handle small track radii, often found in industrial areas (and on model railroads!). Most of the 2068 locomotives are equipped with special switching couplers, in addition to the normal UIC screw-link couplers. The switching coupler is a remote-controlled arm that allows the locomotive to latch onto the hook of a passenger or freight car and move it, without having to go through the regular coupling process. The switching coupler can only used on relatively flat terrain to move one or two cars, as these cars are moved without connecting the cars’ air brakes and the locomotive had to provide all the braking power. The locomotive is equipped with mainline safety systems (automatic train stop, crew alertness monitoring) and can also operate as a road switcher, though in normal operation these locomotives seldom wander far from their assigned terminals — largely because of the importance of having quiet locomotives in urban areas. For example, in Salzburg, interchange traffic with the Salzburger Lokalbahn (SLB), an interurban which also handles substantial freight, is usually done with a 2068. Though both SLB and ÖBB tracks are electrified, they use completely different electrical systems, so the connecting interchange track, which goes through a residential area, is not electrified. The 2068 is historically significant not only because of features that were later used on other motive power, but because it also marked the last successful major railroad project for Jenbacher Werke. The firm, founded after WW II on the grounds of a former German war manufacturing plant, is still in business — but as a now wholly-owned subsidiary of General Electric (now known as GE Jenbacher Werke) it concentrates on the manufacture of gas (as in natural gas, not gasoline) industrial electric generators and related equipment. The relatively small Jenbacher, which had built (among other things) the ÖBB series 2060, 2062, 2043 (a diesel-hydraulic road engine), 5081 (licensed version of the German railbus), 2067, 5047 and 5147 (diesel railcars) and a variety of small industrial (narrow gauge) locomotives, miscalculated when it invested heavily in the development of an articulated diesel railcar train (The “Integral”). That product, possibly ahead of its time, and produced without participation of any major railroads, sold only a few copies and spelled the end of railroad production, which had also included locomotives for Eastern Bloc countries, before the end of the Iron Curtain. Of course, the plant still has its railroad connection and ships large generators by rail. Oh, if you see a 2068 tacked onto the back of an electric-powered regional passenger train, it is probably not acting as a helper/pusher for that train. It is just being moved between terminals. Most shorter passenger trains have more than adequate electric power, so adding the locomotive does not really slow those trains down. Thank you for the information on the OBB 2068 loco. I have seen these at Bludenz and Innsbruck stations It was good to have historical background to these small versatile locos. I will certainly purchase on when they become available later this year. I have one other Jagendorfer loco a 1063 electric loco. They produce well detailed, well made products. I’m pleased that you found the article useful. In case you are not aware of it, about three years ago I also wrote a Blog article about the Austrian electric road switchers (1063, 1163, and 1064). Or, just enter 1063 or one of the other numbers in the Blog search box. This was back when someone else was the Blog administrator, and the images with the article are not ones that I made.